…and I was the first person to come and help at this gorgeous rural guesthouse in Andalucía. I am 52 years old and have spent a large part of my working life here at Cortijo La Haza. My main jobs while at work concern the cleanliness of the rooms and the compound. You will always find me around the place, tidying the rooms, putting out the washing, or helping out in the kitchen of an evening. Occasionally, during busy times, I will help Bernadette with serving the evening meals. My commute to work is just a two-minute walk, you will drive by our house (it says Casa Carmen) when you arrive for your holiday in rural Spain. I am married to Miguel and have a son Francisco Miguel. Like many people in the area, Miguel tends to his olives, and helps others with theirs. It is a hard job, as you will be able to read in another blog post. I absolutely love my job and am always happy to be here. Once I finish work, I spend time at home providing for my family, and, during the off-season I love to do craft work. Needlepoint, sewing and crocheting are my favourite pastimes and you can see some of my work displayed at La Haza. The coming spring 2018, I am taking part in the Iznájar urban knitting, too. Like most Andalusians, I adore the fiestas, and love to dress up in the traditional way. 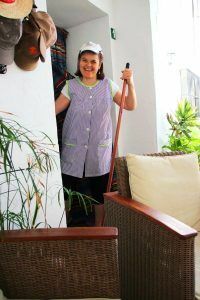 …(short for Elisabeth) and I joined the staff of this cosy hotel in Córdoba (province) about six years ago, to help Carmen out. I am 31 and live with José María and our son Alejandro in Villanueva de Algaidas. José María often passes by at work, given that he is the “fontanero” (plumber) and there are always little jobs to do during the season. When not at work I have a multitude of other things to do. My son takes up a lot of time, of course, but I also help my parents out at their cortijo and I absolutely adore baking and making things for children’s parties. Bernadette and Patriek are no longer surprised to hear I was up until three a.m. making muffins or baking cakes. Just like Carmen, I love dressing up for the ferias. Thanks to our generous guests, we have been able to save up any tips and gratuities for a whole season. Bernadette and Patriek have then taken us to their respective homes so we could meet the families, what a lovely idea. The idea for the next trip will be to have a cruise on the Mediterranean. We think we will need to save up for maybe a few seasons though but it will be worth it in the end.